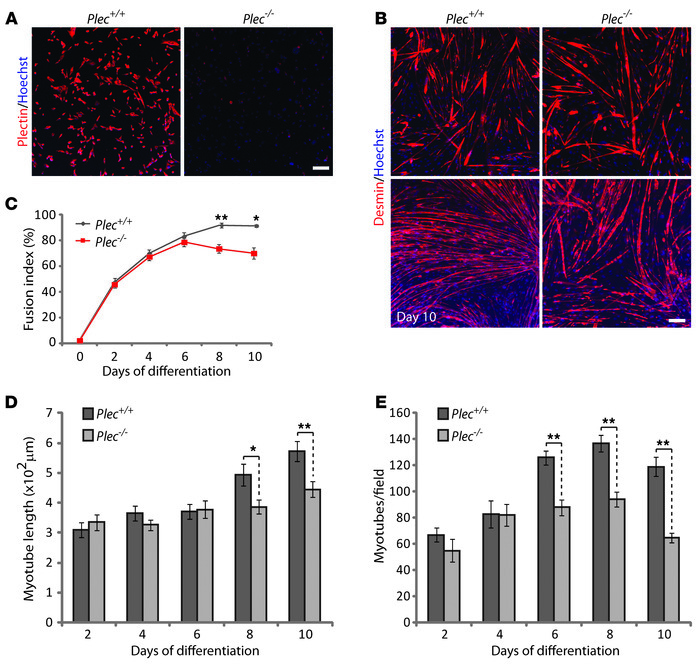 Plec+/+ and Plec–/– myoblasts differentiate and form multinucleated myotubes in culture. (A) Immunostaining of plectin-positive (Plec+/+) and plectin-deficient (Plec–/–) myoblasts using pan-plectin antibodies and visualization of nuclei (Hoechst). (B) Myotubes differentiated for the time indicated were subjected to immunostaining (desmin) and staining with Hoechst dye. Scale bars: 100 μm (A and B). (C) Fusion indices (ratio of differentiated myotubes containing 2 or more nuclei to the total number of desmin-positive cells). (D) Length of myotubes. (E) Absolute number of myotubes per randomly chosen microscopic field. Data shown in C–E represent mean ± SEM, 3 experiments each. *P < 0.05, **P < 0.01, unpaired Student’s t test.